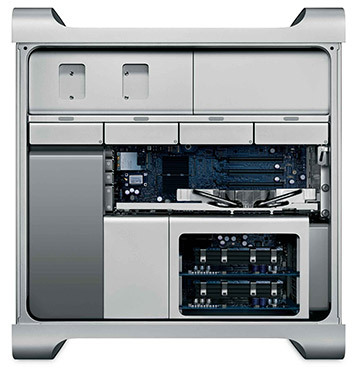 The model Mac Pro "Eight Core" 3.0, with Model ID: MacPro2,1 (Gen 1) is an upgrade from the original Mac Pro (MacPro1,1). It gets it's heartbeat from two 3GHz Quad Core Xeon X5365 Clovertown processors with 8MB of dedicated level 2 cache per processor, a 128-bit SSE3 vector engine and 1.33GHz 64bit dual frontside buses. Expansion is where these models shine with 8 memory slots, each accepting up to 4GB per slot, yielding 32GB possible maximum. 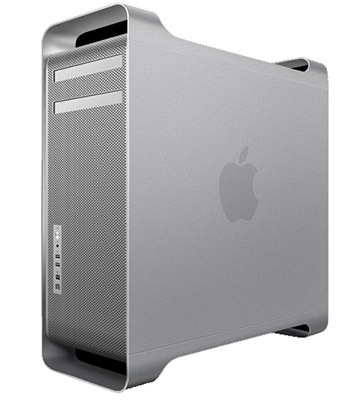 It also has 2 external 5.25" front bays, 4 internal 3.5" drive bays and 4 PCIe slots, 2 Gigabit Ethernet, 5 USB 2.0 ports, 2 Firewire 400 ports, 2 Firewire 800 ports, optical digital audio in/out, AirPort Extreme (802.11g/n), Bluetooth 2.0+EDR, with a modem option.